While it may have a silly name, the Ferrari LaFerrari is gearing to become the king of exotic sports cars. Clocking in at $1.4 million dollars, it certainly costs a pretty penny. 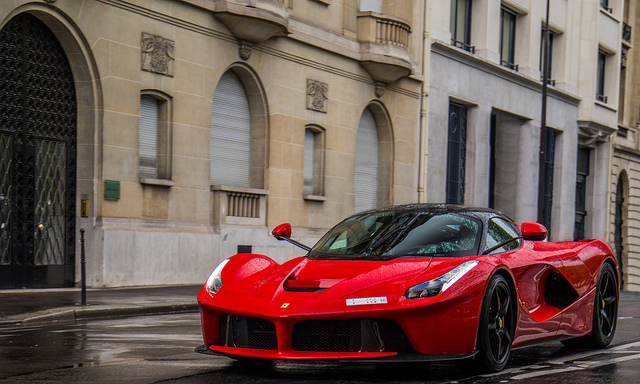 The LaFerrari is powered by a 950 horsepower hybrid engine. The V12 outputs 789 horsepower and gets the additional 161 of its horsepower from an electric motor. With a 0-60 mph time of 2.5 seconds and a 0-150 mph time of 9.8 seconds, the LaFerrari is no slouch, beating the Bugatti Veyron 16.4 by 1.5 seconds. A very low center of gravity and light steering allows the LaFerrari to navigate high speed turns with grace, although with that price tag you may not want to fly around corners for fear of destroying your investment.